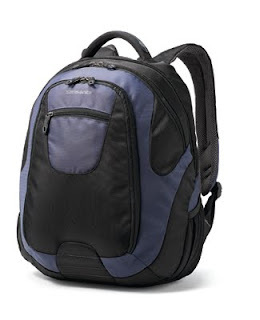 Community College Success: Do You Wear a Backpack? 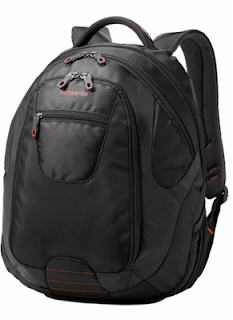 Do You Wear a Backpack? I was a commuter student all 4 years of college and - especially when I transferred to a university – I was known as the girl with the really big bag. Why did I carry such a huge Marry-Poppins type quilted cloth bag? B) I had to bring multiple books and materials every day since in between classes I often did HW for other classes. When you don’t have a dorm you’re not exactly rolling out of bed, grabbing the book you need for the next class and then heading off to class with a book and a folder, you need stuff – lots of stuff. My biggest secret to getting straight A’s in college as a commuter student was scheduling my classes far apart so I would spend extra time in the library getting my homework done (room/apartment = sleep and fun. Not a good place for HW). But in order to do that I needed materials for all of my classes on me at all times. This may seem incredibly crazy and stupid, but for some reason I stopped wearing backpacks after middle school. In high school I started using totes and messenger backs and so for some reason in college getting a backpack never occurred to me. So recently Samsonite sent me one of their new tectonic backpacks to try out and review on the blog (and first of all, yes, that is so cool! I’m officially a blog celebrity getting SWAG. The only problem is now I have a huge head and walk around telling my husband to watch out because I may start traveling the world going to red-carpet events now that I’m so legit ;). If you know anyone who works for Banana Republic, Oreos, or Hawaiian Airlines please let them know I’d be happy to accept their products and tell everyone on my blog how amazing they are). I WISH I HAD THIS BACKPACK WHEN I WAS IN COLLEGE. I would never share anything on this blog that I didn’t 100% believe in, and this backpack literally rocked my socks off. To put it in perspective, when I heard I was getting a free backpack I thought well I’ll try it out and then give it away because I’m not really a backpack person. But all it took is me gliding the smooth zipper that felt like it would last 100 years and looking into all the compartments and feeling inside the solid laptop case that’s in the back pocket and thinking about how much the designer messenger bag I bought for my laptop kills my shoulders to have me 100% COMPLETLEY IN LOVE with this backpack. In order to try it out I decided to start doing my Masters homework during my lunch break at work. So I stuffed the backpack with my books, folders, papers, water bottle, lunch, pens, laptop, laptop charger, and headphones and headed out the door for a few days. The back of the backpack is padded so it is so comfortable. And the zippers are literally a dream to open and close. I can’t quite explain this but it was the first thing I noticed and I seriously love opening and closing this backpack. It has so many compartments so all of my little things stayed in place and it was so easy for me to quickly retrieve something I needed. And even carrying a heavy laptop and books did not feel like a burden in this thing. The laptop sleeve inside is so secure that I feel like I could throw the backpack across the room and my laptop would be fine. Being organized in school is more important than you think. When you can easily find your stuff, have what you need to bring everything you need, and know where everything is at any given time, it can increase your confidence and make you feel more prepared. Think about your first days of school when you were younger. I can so clearly remember putting my new box of freshly sharpened colored pencils in my Lion King backpack.Why should that feeling change in college? Find a backpack you LOVE and that will LAST all 4 years. Hint: THIS IS THE ONE! I’m a pretty girly person but I have to tell you I am in love with the backpack look. It comes in a few different colors so you can get one that has a bit more flare to it, (I like the blue one) but I have to say I really do love the black one. It goes with everything and has the classic and trusted Samsonite logo in this great orangey/coral color that I really like. Okay so this obviously wasn’t me in college but I wish it had been! So now I’ll be using this incredible backpack any chance I get. It’s come in handy a lot at work with all of the travel and supplies we use. And I know it’s going to change my life next time I travel and won’t have to kill my shoulder with my laptop bag. I highly recommend this backpack. It will change your life and be your best friend and help you stay organized even if you’re not an organized person and keep your back from hurting and hug you all the time and help you get better grades and keep your electronics safe and make you look cool. And if you ever meet up with me for anything, I’ll be the girl with the awesome no-nonsense magical Samsonite Tectonic backpack. 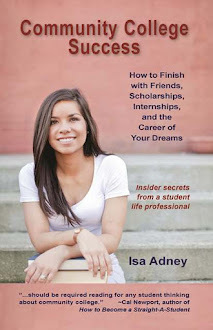 To read more about Isa's personal story & how you can build relationships to: make positive friends, be more successful in academics and work, find the right people to connect with, and access the hidden job market, grab a FREE e-copy of the first chapter of Community College Success: How to Finish with Friends, Scholarships, Internships, and the Career of Your Dreams! Claim your free copy on the Facebook page! it looks roomy...my son needs a goodback for college too.